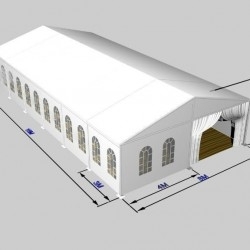 Our tents are available in clear span width from 5m -60m and eave height from 3m – 6.2m in the structure of unlimited length. Versatile and lightweight making assembling and dismantling easier. Tents Manufacturer provides unlimited solutions for all types of large scale temporary structure applications in the utmost style and design. 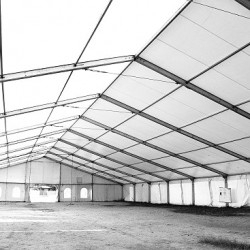 Our extensive range of large tents structures is available in a variety of clear span widths ranging from 5m x 50m wide. 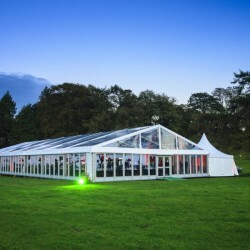 Large event marquee structures are supplied in numerous shapes, design and sizes and can be custom designed to your specifications. 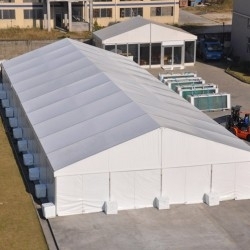 Frame Tents Manufacturer specializes in the manufacture of tents, marquee, table and chair. 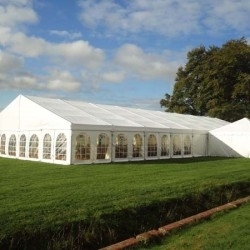 We are committed to manufacturing excellent quality tents and marquees at the most competitive prices. Our low prices do not mean that we compromise on quality, all marquees and tents are manufactured to the top standard. 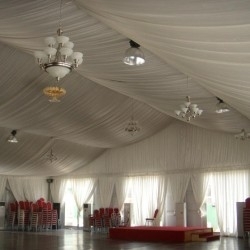 The company has a top proficiency in the manufacturing of tents, marquee, table and chair. We have a professional team to offer the top of quality and service. The company takes pleasure in introducing itself as one the biggest Tent Manufacturer, Tent Supplier, Tents Exporter, Tents Wholesaler from Durban South Africa. 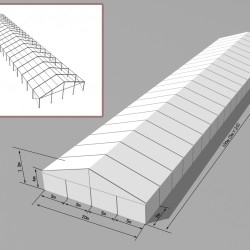 Where Can I buy a Frame Tent? 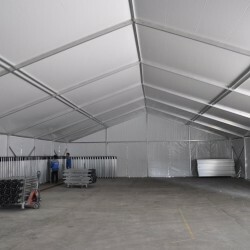 If you are looking for a Frame Tent to buy in South Africa, We manufacture and supply the best marquees and tents in South Africa at cheapest prices. 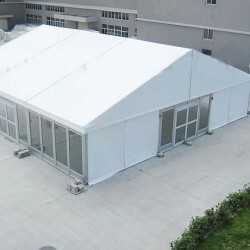 We supply tents like peg and pole tents, marquees, frame tents, aluminum tents, canvas tents, frame tents, aluminum tents, disaster tents, relief tents, refugee tents, military tents, army tents, Bedouin tents, function tents, wedding tents, party tents, exhibition tents, army tents, luxury tents, events tents, exhibition tents, storage tents, warehouse tents, peg and pole tents, alpine tents, emergency shelter tents, Bedouin tents, pagoda tents, plastic chairs, Tiffany chairs, tables, portable toilets and mobile chillers in countries like South Africa, Mozambique, Angola, Swaziland, Kenya, Botswana, Zambia, Zimbabwe, Namibia, Nigeria & Lesotho. 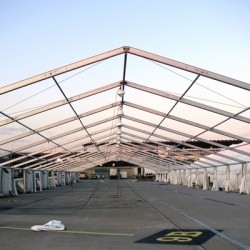 AFrame Marquee tents can be erected on tar and paving without damaging the surface. AFrame tents do not have any centre poles that are obstructive and is the perfect solution for conferences and modelling shows that showcase presentations and performers. 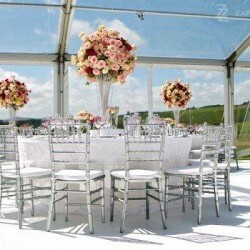 AFrame tents are very neat, upmarket and create the ideal venue for any kind of event. This tent design has been around for many years. You could almost say that it brings a sense of emotional comfort for those who use it. AFrame Marquee tents range from 5m x 10m through to 9m x 30m and we also can custom make any size to your specific requirements. Length can be extended by 5m. Custom made tents are welcome. We offer a range of colours, from shaded products, with UV protection, anti-microbial, mosquito & water repellency to a watertight high gust hurricane solution. Decoration lining, light, ABS solid wall, ground anchors, PVC-clear for sidewalls, wooden floor, glass door, rain gutters, portable toilets, gas stoves, chairs, tables, table cloths, chair covers, windows. AFrame packed in membrane film. Hardware packed in with the wooden case. Roof and side wall in a professional PVC carry bag. Recycle using with long life, easy setup and dismantling, convenient stock and transport. 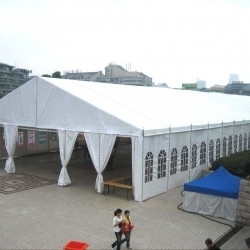 Clear span tents can be applied as exhibition tent, marquee, big party tent, wedding tent, corporate event tent, warehouse tent, garden tent, industrial tent, trade show tent, commercial tent, carport tent, military and relief tent, high peak mixed tent etc. © Copyright 24-04-2019 02:53:44 by Tents Manufacturer. All Rights Reserved.